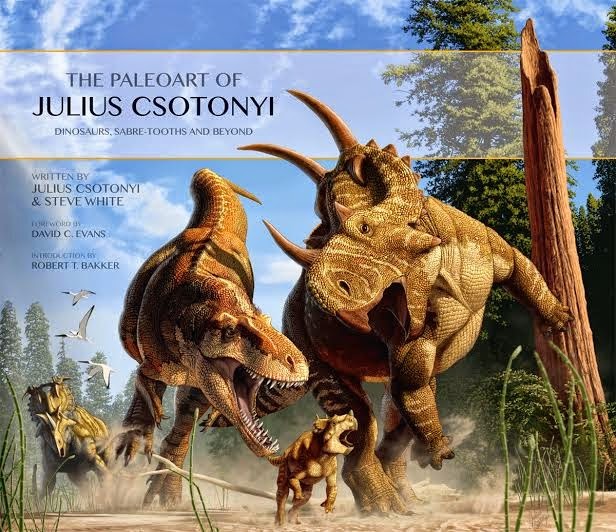 Tell us a little bit about your new book, “The Paleoart of Julius Csotonyi.” What was the inspiration for this compilation? How long did it take you to create, and did you discover anything along the way? I have my coauthor and editor Steve White to thank profusely for making this happen and for taking me on board. He edited a previous volume, the hugely popular and successful “Dinosaur Art: The World’s Greatest Paleoart” (2012), which was a compilation of 10 different paleoartists’ works, and to which I feel honored to have been invited to contribute. When Steve approached me for new book to feature exclusively my work, I was ecstatic. The book took nearly a year to compile, on my end partly because I wanted to create as many brand new pieces of artwork for it as I could fit between my other illustration projects. We also collaborated with several of the museums with which I have worked to acquire rights to include many of the new murals that I created for them. The result is that around three quarters of the pieces in the book have either never been published before or were first displayed from 2012 onward. In addition to the artwork, the book contains short blurbs about the science or anecdotes of research experiences contributed by around 20 generous paleontologists with whom I have had the fortune to collaborate over the years. So in the end, the book is mostly paleoart, with many large format images, with some science thrown in for good measure as well. 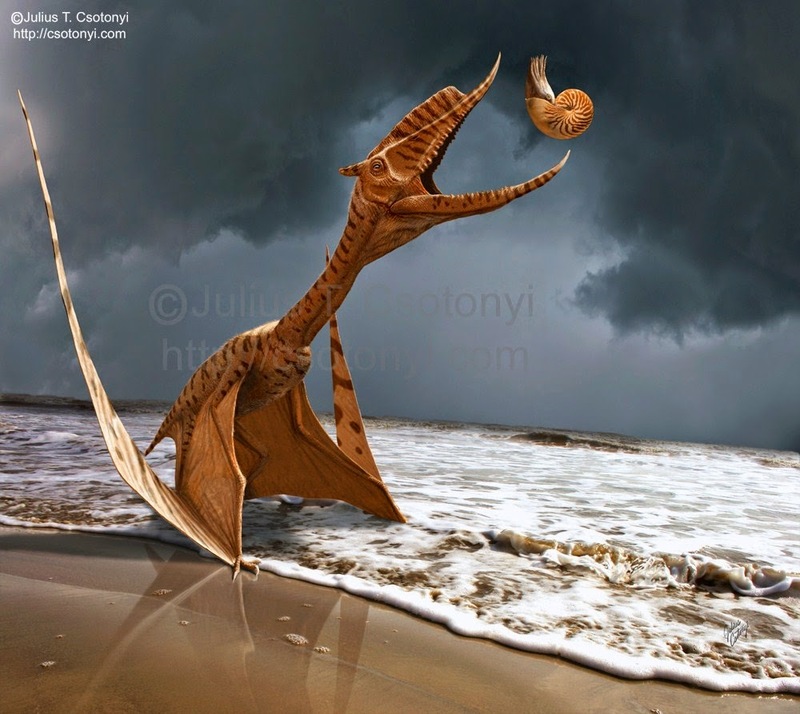 As a scientist yourself, do you think that you approach paleoart with a little bit more technical of a mindset? What sort of research do you typically do before painting a scene? I place high value on accuracy, precision and being clear about what is well supported and what is speculative in my restorations. I feel that in my case at least, this value was instilled by my scientific academic and research experience (about 16 years of it before I shifted career paths). I consult original scientific publications prior to restorations whenever they are available. A lot of my work is commissioned by paleontologists interested in acquiring a restoration either for a figure in a manuscript immediately prior to submission, or for a press release. In these cases, my background research consists of confidential access to the manuscript that is in the process of publication, direct correspondence with the author(s) of the paper and background research of published literature to fill in the gaps in the restoration outside of the scope of the new research (e.g. an appropriate natural environment of a novel species). Three cheers for open access journals! Are there certain time periods that you enjoy painting more than others? A quick glance at my portfolio would suggest that I put most of my effort into Late Cretaceous restorations. 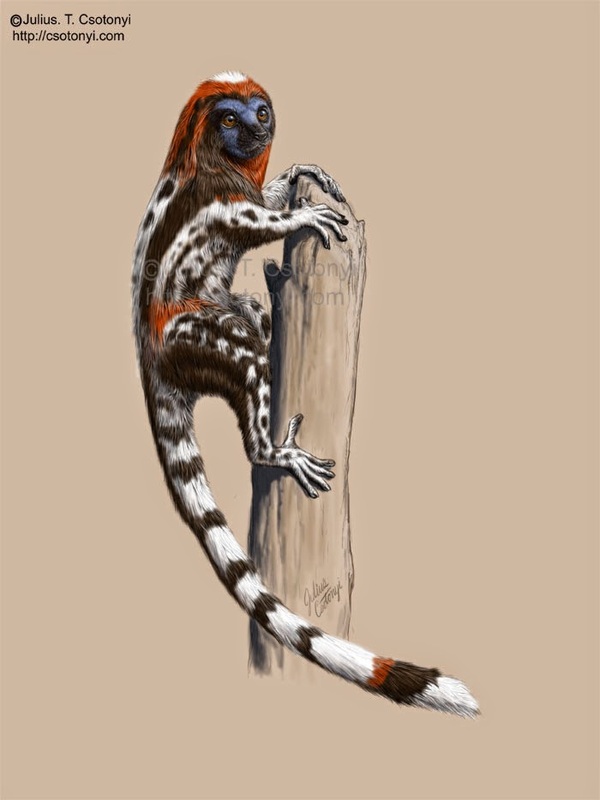 But I think that is governed mostly by both the wealth of fossil material from several wonderful (and for me, relatively local) Late Cretaceous formations and my tendency to network with people that study relatively similar lines of research. In truth, I have a great fascination with anything unfamiliar. The weirder, the more it interests me. So, the farther back in time we look, the more bizarre (compared to today) the biological world looks. I am currently greatly expanding my portfolio to encompass much older periods than the Cretaceous, and the Devonian, Silurian, Ordovician, Cambrian and earlier times are really starting to pique my interest. I hope to be creating a lot more work featuring these fascinating intervals in Earth’s history, with a lot higher invertebrate representation than my previous work. Let's talk a little bit about your microbiology work. As paleontologists, we’re often walking in exposed areas which frequently have biotic crusts… which means we spend a lot of time crushing one of your (many) study organisms. Sorry about that. But seriously, we’ve long heard that some of these crusts are incredibly delicate - how big of an impact do you think we’re having, simply by where we walk? Aha, now I know who’s been destroying all my study organisms and giving soil crust biologists trichotillomania [chronic hair loss]! Actually, the degree of damage that we exert on biological soil crust communities depends on a number of factors, including the degree of physical stress of the environment (low rainfall, high temperature and rapid water drainage in sandy soils all make life more difficult for biological soil crust organisms) and the dominant biological composition of the soil crust community. For example, in arid regions of the southwest, cyanobacteria-dominated soil crusts generally tend to recover more quickly from trampling damage than do moss-dominated communities. Not only can filamentous cyanobacteria grow more quickly than moss plants, but entire filaments of some species are motile and can also glide through the soil to more quickly patch up damage to the community. Indeed, some trampling can actually help to propagate cyanobacterial soil crusts by dislodging pieces of it and transporting it to new locations, where it can establish new growth. My own microbiological research along with our lab team demonstrated that another previously unrecognized component of the biological soil crust community in sandy soils is the ubiquitous aerobic anoxygenic phototrophic bacteria. Their role in the crusts is still not well understood, but they at least provide sources of carbon to the rest of the community. However, in arid regions, these crucial biological communities help to stabilize the soil against the effects of wind and water erosion, increase the nutrient content of the soil (many contain nitrogen-fixing cyanobacteria) and increase the water retention capacity of the soil. If the sandy ground is covered by dark bumps or pillars or patches, it’s helpful to make an effort to step around the patches and to try to minimize traffic over regions of soil that are covered by these formations. Soil crusts: pretty cool, but still not vertebrates. Hopefully we’re just making more habitat for mosses? Well yes, there are funky mosses, especially in the genus Tortula, that are arid land specialists and can be found growing on some desert sand dunes. Their evolutionary characters that allow them to survive in such harsh environments make them amazing to watch during rainstorms. When dry, they are brown, crispy and shriveled looking, their leaves curled tightly around their stems. As soon as water hits them (try spitting on a dry plant of Tortula ruralis) the leaves unfurl and extend outward from the stem, simultaneously turning green as they rehydrate, which is accomplished in mere seconds. At the start of a rain storm, it is impressive to watch spots of green form quickly in a field of brown moss following the impact of large drops of rain. One of your papers discusses the influence of microtopography (that is, hills and valleys on a much smaller scale caused by hoofprints) on the growth of mosses in Jasper National Park. How exactly did you wander across that particular topic? Could you tell us a little bit about that research? It was a case of coming across visual patterns whose investigation led to the elucidation of an underlying process. I was wandering the sandy shores of Jasper Lake as part of an effort to identify a M.Sc. research project when I noticed a visually obvious association between elk hoof prints and moss plants. It looked a lot like moss plants were growing inside and on the leeward side of small escarpments formed by the indentations left by hoofed animals. That interested me because we’re used to thinking of trampling (especially in physically stressful environments such as the windy sand dunes on the leeward shores of Jasper Lake) as a destructive force rather than facilitative. In marginal semiarid to arid environments, mosses, lichens and microorganisms such as cyanobacteria form communities called biological soil crusts, which are usually important to the stabilization of fragile soils that are often otherwise unsuitable for the germination and establishment of vascular plants. Hence, biological soil crusts are instrumental to biological succession in such harsh environments, and previous research had demonstrated that these nonvascular communities are usually very sensitive to and easily injured by physical disturbance such as trampling. My research showed that when the soil was capable of long-term retention of microtopography (e.g. in silt-rich rather than sandy soils, and in the deep form-preserving mats of sediment-covered dead stems of the arid-soil moss Ceratodon purpureus), persistent microtopography could significantly reduce exposure of growing moss plants to the desiccating effects of wind and sun, leading to increased rates of growth. 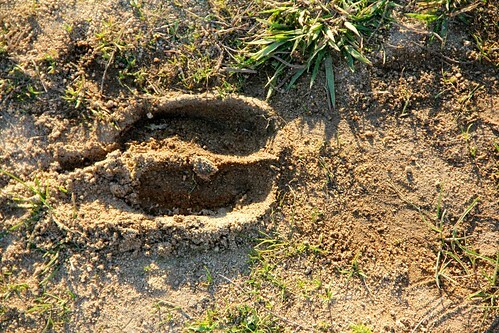 This positive effect was maximal at intermediate levels of disturbance, and above a certain intensity of trampling, the positive effect was cancelled, probably by the destructive effect of additional trampling on both the microtopography generated by earlier hoof prints, and by accumulated damage incurred by the moss from too frequent trampling. Meaghan's been ready for the Santa-faking task for years. Photo by David Levering, disgruntled face by Ceri Weber. Despite the helpful efforts of national park rangers in providing me with actual elk hooves from the unfortunately common phenomenon of road kills, it turned out that the most practical means of simulating trampling for controlled experiments on stands of moss was the construction of a bionic elk leg from a wooden post of the right diameter and a rim of wire to emulate the raised edge of elk hooves. I then calculated the appropriate amount of weight to apply to the ELK 2.0 CyberLeg to simulate the pressure exerted by an average adult Cervus elaphus while walking (i.e. the weight of the animal divided over the three hooves that are usually in contact with the ground at once), and I proceeded to generate artificial elk hoof prints on stands of moss. It worked like a charm and I got useful results. While somewhat less authentic than the real thing, this method has the added advantage of being less traumatizing to demonstrate to 8-year-olds, as it involves no vehicle-harmed Rudolph parts. For Meaghan’s Santa simulator project, though, I would recommend a little more extensive fashioning of the hoof outline than I did, since satisfying the visual discernment of 8-year-old human eyes is a little more tightly constrained by form than is the generation of sufficient microtopography to facilitate moss growth. As paleontologists and geologists, we often play drinking games to bad movies (cough cough, The Core). Are there movies that feature particularly awful microbiology that you’d like to take this opportunity to call out? There are quite a few. The worst are the zombie movies that explain the undead as victims of viral infection; these are terribly far off the mark. One of the biggest mistakes made is the rapidity of symptoms following infection. Viruses do not kill in seconds. World War Z, 28 Days Later (and its sequels), Dawn of the Dead, the list can go on. What’s your favorite bacteria, and why? That’s an even more difficult question to answer than what is my favourite dinosaur. Bacteria are so much more diverse at a deeper level than are animals and plants. For example, all animals breathe oxygen, using it to facilitate aerobic respiration in order to oxidize or break down high energy carbon compounds into simpler, lower energy forms, conserving the energy released in the process in order to do useful work in the cell. However, in the research that I conducted in collaboration with research teams in the lab and on the deep ocean hydrothermal vent research cruises to the Juan de Fuca and Explorer Ridges (wonderful experiences, by the way! 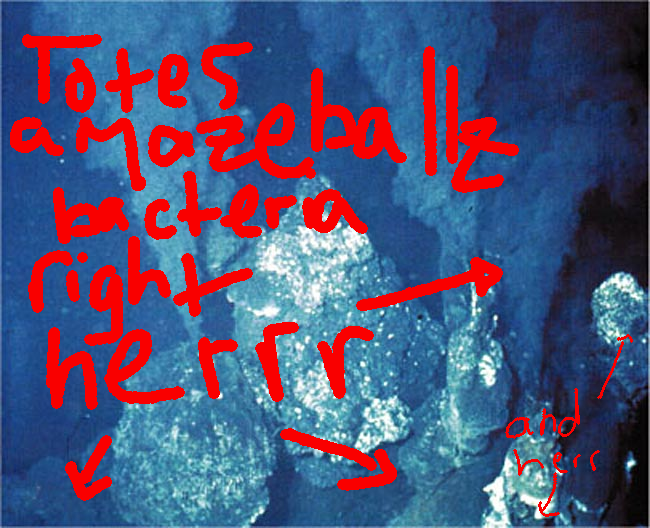 ), we found bacteria in the vicinity of metal-enriched black smoker chimneys a mile beneath the ocean surface that utilized toxic metal oxide anions such as metavanadate (VO3-), or even more toxic metalloid oxyanions such as tellurate (TeO42-) or selenite (SeO32-) in an analogous way that we use oxygen in our cells. You could almost say that these unusual bacteria ‘breathed’ these toxic metal compounds. They performed anaerobic respiration, using these toxins as terminal electron acceptors. In fact, I was excited to publish, along with our team, the first paper describing the use of a tellurium compound in such a way by life forms. Another amazing bacterium that we discovered and on which I conducted research (and which we described as Charonomicrobium) is the first organism that we showed to be capable of performing anoxygenic photosynthesis (i.e. harvesting light to turn its energy to chemical energy, but not generating oxygen as a byproduct the way that plants do) in the presence of oxygen and in its absence. It may seem like a subtle technical difference, but it demonstrates that this bacterium possesses an especially impressive “Swiss army knife” of metabolism at its disposal, and is therefore able to use a much wider range of environmental conditions for photosynthesis than any others of its relatives that were previously known. 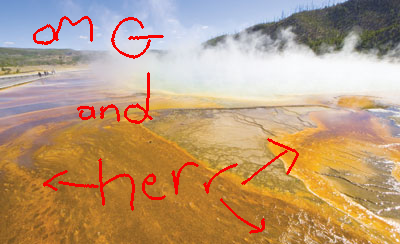 Of course, there are also the myriad of extremophilic bacteria and archaea that actually require temperatures, salinity and/or other conditions for survival that would kill us, such as more than 100 degrees Celsius (212 degrees Fahrenheit). Deinococcus radiodurans is an especially amazing bacterium. As its specific epithet suggests, it can survive extremely high doses of ionizing radiation, such as would be found near nuclear reactors. This creature would survive a nuclear holocaust. It uses a number of different cellular mechanisms to achieve such a high resilience in the face of X-ray and gamma ray induced damage. For example, it has very efficient DNA repair enzymes that can actually reassemble an intact chromosome from one that has been sliced into several parts by massive radiation doses. Also, its cells grow in clusters of four (called tetrads); if a tetrad is exposed to radiation powerful enough to overwhelm the impressive repair mechanisms of even three of the four cells in the tetrad, the final remaining cell takes over and forms a new tetrad to carry on the lineage. It is these incredibly resilient extremophiles that form the basis of astrobiological research into the prospect of finding life on other planets, because they have been demonstrated to survive conditions that exist on several of the planetary bodies in our own solar system. Lastly, do you have any advice or words of wisdom for our aspiring paleo artist and microbiologist readers out there? What did you find was your most powerful motivator to get you through graduate school and your professional work as an artist? I have found that the most powerful motivator for my work, both as an artist and as a researcher, is a deep interest in the subject and sense of great scientific curiosity. When it comes to work that requires the enormous number of sleepless hours that either an intensive graduate school program or a series fast paced illustration projects does, I think that one can only practically maintain high performance so long as one is sufficiently inspired by the material for it to be self-motivating. Therefore, it’s crucially important to take the time to find a field of work or study that really intensely holds one’s fascination, and does so in a sustained way over the long term. I have repeatedly observed that even under the crushing pressure of an impending deadline, I actually revel in the work of painting; it relaxes me and gives me a lot of satisfaction even under pressure. To me, that is the best indicator that I have chosen the field that suits me best. The other thing to do is to keep on top of current research. It seems like an obvious thing to suggest, but it is really easy to fall behind, and in both science and scientific illustration, one is much better respected if one can demonstrate that one is familiar with the material. To that end, I dream of the day when all scientific journals will be open access! And as one reads, it’s very important to hone one’s critical thinking. It’s very easy to simply accept published results, but it takes a lot more effort and skill to evaluate the veracity of the results presented in literature, once a sufficiently wide basis of knowledge is attained in a given field to effectively critically evaluate the rigor of results. Finally, observe the natural world. Becoming familiar with the scientific literature is certainly important, but don’t only read about it. Be as observant of patterns in nature as you can; take photos and notes on the way that light behaves under different circumstances, or the multitude of shapes of water waves, or the range of forms and color through which flames pass in different kinds of fire. Keeping an eye out for patterns is an invaluable skill for both scientific illustration and science alike. It is pattern recognition that led me down most of the avenues of investigation that led to fascinating discoveries. And of course, remember to have fun! For me there is no more enjoyable work than learning about the natural world, and both expressing myself artistically and participating in scientific outreach through paleoart and other forms of scientific illustration. What Can I Wear to This Conference?